Got a stinky sink or garbage disposal? These work GREAT! Not only will it make your drains smell good, it also scents your kitchen while it's 'soaking'. Simply fill your sink with HOT water, add sink freshener & wait until the water is cool. Pull the drain & rinse out your sink. It's that simple! May take 1 week if out of stock. Have a stinky sink or garbage disposal? These work GREAT! 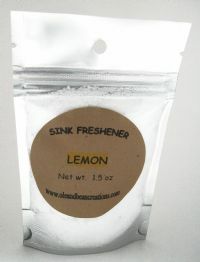 Not only will it make your drains smell good, it also scents your kitchen while it's 'soaking'. Simply fill your sink with HOT water, add sink freshener & wait until the water is cool. Pull the drain & rinse out your sink. It's that simple! Pick which three scents you would like. This is the multiple use size! Also makes a GREAT gift! This will either come in a bag (as pictured) or in a jar.